Third Street between Cherry and Washington streets might be a gathering spot the next couple of days for adults who like craft beer. 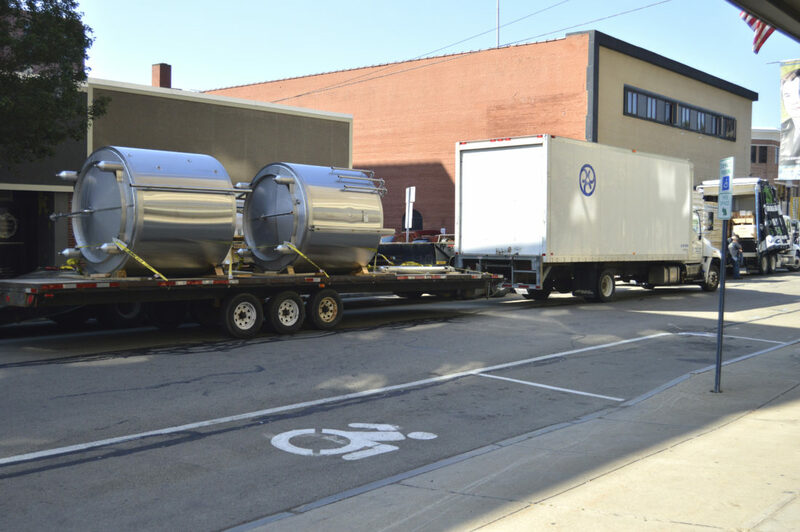 The street has been closed to vehicle traffic as brewing equipment, including 14 stainless steel tanks, is moved into the Jamestown Brewing Company. Jon McLellan II of the Jamestown Brewing Company said the future bar and restaurant that will also produce and distribute its own craft beer is moving in all of its brewing equipment, which will be completed by Friday. “We are excited the equipment is finally here and getting dropped into the pit in the basement,” McLellan said. Prior to moving in the equipment, the doors to the former W.T. Grant Department Store had to be removed to move in the large brewing tanks. The plan for the layout of the restaurant is to have the brewing tanks in the basement with a section of the first floor removed so patrons can see the lower level to watch the beer making process from the restaurant and bar area. Matt Redpath, Jamestown Brewing Company head brewer, said they will have a 20-barrel system, with each barrel holding 31 gallons or two kegs per a barrel. McLellan said the business will open this fall, with the goal to distribute their craft beer to other local bars and restaurants shortly after opening. He said, depending on popularity, Jamestown Brewing Company beers might eventually be sold in local grocery stores as well. The father and son team of McLellan II and Jon McLellan, along with GPatti Development, are the project leaders. Earlier this year, McLellan II told The Post-Journal the restaurant will seat around 300 people, with 168 available on the mezzanine and 124 accessible on the first floor. There will also be a third floor banquet room, which can fit a large group of around 300 or can be retrofitted for smaller occasions. He said there will be a lounge area, with pub and booth seating available in the bar and restaurant area on the first floor. Also, the south wall of the upper floor will be replaced by windows so people can see what is happening at the National Comedy Center along West Second Street. He added that in future years, they want to be able to offer customers outdoor seating and roof top access. For more information on the Jamestown Brewing Company, visit their Facebook page.